Every quilter wants to make eye-catching quilts, and if they can do so while saving time, that's a win-win! Follow along with quilting expert Nancy McNally as she shows you all the ins and outs of using precut fabric strips for the beautiful jewel-toned stained glass areas of the quilt that she designed exclusively for this class. You'll be amazed how quickly it comes together! I enjoyed the class and learned a few things too. The instructor was good. Enjoyed this class. It helped me to fine tone a few points. Have not tried this stained glass pattern but diffently will. The instructor makes it look so easy. 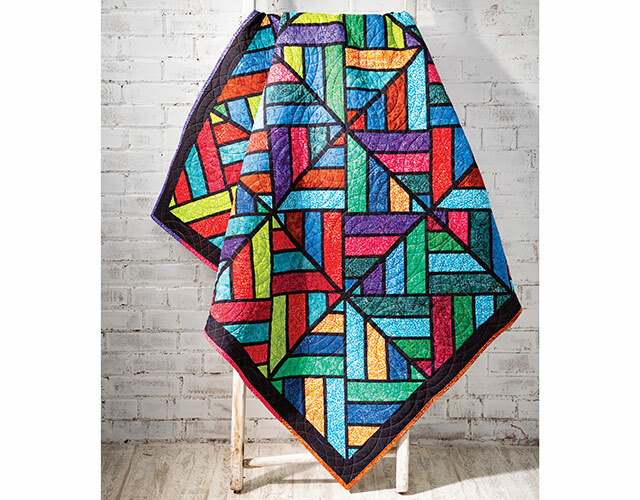 HELP, I really like the tessellating diamonds quilt shown above. I'm trying to buy this complete kit in the same colors and I cant figure out where to get the kit. Thank you for your time ! This was the second quilt I made and the directions were clear and simple to follow. I did not watch the class video but still found it fairly easy to construct. Wish I could upload a photo. I just finished my quilt, I did it in jewel tones, purples, pinks and blues and am I pleased with it! The class was good and the instructor was easy to follow, was a really enjoyable project!